• “Blowin’ Up the Set” by Holly Bass, American Theatre, 1999. • “Hip Hop Theater: The New Underground” by Eisa Davis, The Source, 2000. • “Can You Rock It Like This? Theater for a New Century” by Holly Bass. In The Fire This Time: Young Activists and the New Feminism, edited by V. Labaton and D. L. Martin. New York: Anchor Books. 2004. “Refugees in Ghana Find Their Voice in Hip Hop Culture,” Service Matters, NYU, 2006. “How Hip Life Theatre was Born in Ghana” by Daniel Banks, American Theatre, 2008. 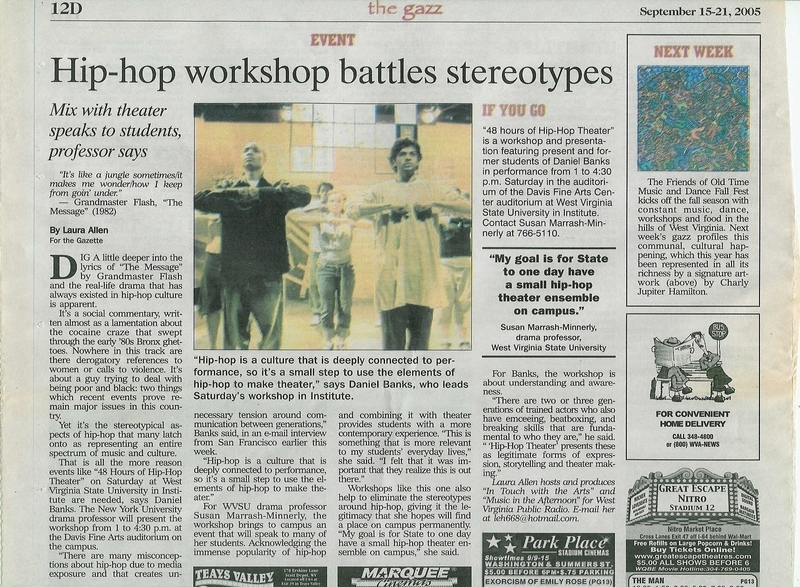 “Hip-hop Theater’s Future and ID” by Logan Whiteside, Washington Square News, 2008. “Hip Hop Theatre: The Voice of Now” by Daniel Banks, Page and Stage, 2009. “Hip Hop Theatre: A Call for Change” by Daniel Banks, for Curtains Up!, War Child Holland Training Manual, 2009. “From Homer to Hip Hop: Orature and Griots, Ancient and Present” by Daniel Banks, Classical World, 2010. “Youth Leading Youth: Hip Hop and Hiplife Theatre in Ghana and South Africa” by Daniel Banks, in Acting Together: Performance and the Creative Transformation of Conflict, New Village Press, 2011. • “Hip Hop Intelligences” by Daniel Banks, in An Unimagined Space: Beyond the New WORLD Theater. A project of the Hemispheric Institute, New York University (publisher TBD). “Here We Go, Yo…” by Danny Hoch, American Theatre. 2004. “Hip Hop as Pedagogy: Something from Something” in Theatre Topics (Vol. 25) by Daniel Banks, Ph.D. 2015. There are many excellent books on Hip Hop culture. This is only a starter list. 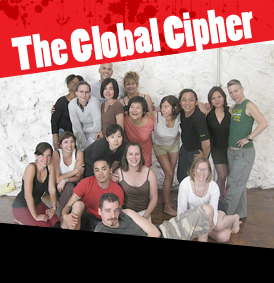 Please add suggestions of others on the Global Cipher page! Banks, Daniel (ed). 2011. Say Word! 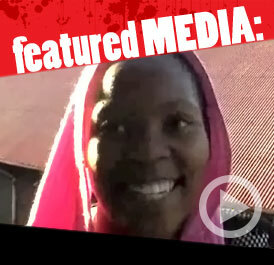 Voices from Hip Hop Theater, Ann Arbor, MI: University of Michigan. Boyd, Todd. 2003. The New HNIC. New York: NYU. Chang, Jeff. 2005. Can’t Stop, Won’t Stop: A History of the Hip Hop Generation. New York: St. Martin’s. Chang, Jeff. 2007. Total Chaos. New York: Basic Civitas. Elam, Harry and Alexander, Robert (eds). 2002. The Fire This Time: African American Plays for the 21st Century. New York: Theatre Communications Group. Euell, Kim and Alexander, Robert (eds). 2009. Plays from the Boom Box Galaxy: Anthology for the Hip Hop Generation. NY: Theatre Communications Group. Flores, Juan. 2000. From Bamba to Hip Hop: Puerto Rican Culture and Latino Identity. New York: Columbia University Press. Forman, Murray and Neal, Mark Anthony (eds). 2004. That’s the Joint: The Hip Hop Studies Reader. New York: Routledge. Fricke, Jim and Ahearn, Charlie (eds). 2002. Yes, Yes, Y’All: The Experience Music Project Oral History of Hip Hop’s First Decade. New York: DeCapo. George, Nelson. 1998. Hip Hop America. New York: Penguin. Harrison, Paul Carter; Walker, Victor Leo; Edwards, Gus (eds.). 2002. Black Theatre: Ritual Performance in the African Diaspora. Philadelphia: Temple University. Kelley, Robin D.G. 1997. Yo Mama’s Disfunktional! Boston: Beacon Press. Kitwana, Bakari. 2002. The Hip Hop Generation. New York: Basic Books. Kitwana, Bakari. 2005. Why White Kids Love Hip Hop: Wangstas, Wiggers, Wannabes, and the New Reality of Race in America. New York: Basic Civitas Books. Parker, Kris (KRS-One). 2003. Ruminations. New York: Welcome Rain. Perkins, William Eric.1995. Droppin’ Science: Critical Essays on Rap Music and Hip Hop Culture. Philadelphia: Temple University. Perry, Imani. 2004. Prophets of the Hood: Politics and Poetics in Hip Hop. Durham and London: Duke University Press. Potter, Russell A. 1995. Spectacular Vernaculars: Hip Hop and the Politics of Postmodernism. SUNY Press. Rivera, Raquel Z. 2003 New York Ricans from the Hip Hop Zone. New York: Palgrave Macmillan. Rose, Tricia. 1994. Black Noise by Tricia Rose. Middletown, CT: Wesleyan. Rose, Tricia. 2008. The Hip Hop Wars: What We Talk About When We Talk About Hip Hop—and Why It Matters. New York: Basic Books. Schloss, Joseph G. 2004. Making Beats: The Art of Sample Based Hip Hop. Middletown, CT: Wesleyan.